Nelson Rolihlahla Mandela, born 18 July 1918, served as President of South Africa from 1994 to 1999, and was the first South African president to be elected in a fully representative democratic election. Before his presidency, Mandela was an anti-apartheid activist, and the leader of Umkhonto we Sizwe, the armed wing of the African National Congress (ANC). In 1962 he was arrested and convicted of sabotage and other charges, and sentenced to life in prison. Mandela served 27 years in prison, spending many of these years on Robben Island. 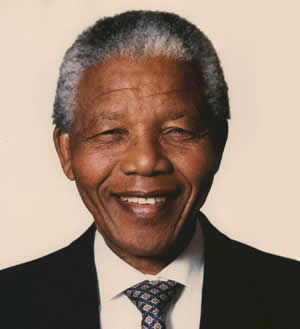 Following his release from prison on 11 February 1990, Mandela led his party in the negotiations that led to multi-racial democracy in 1994. As president from 1994 to 1999, he frequently gave priority to reconciliation. Mandela has received more than 250 awards over four decades, including the 1993 Nobel Peace Prize. Sobhuza succeeded Ngwane V as Paramount Chief of Swaziland on December 10, 1899, when he was only a few months old. His grandmother, Labotsibeni Mdluli, acted as regent until December 22, 1921. His nominal reign of 82 years, 9 months is the longest precisely dated monarchical reign on record and the longest documented reign of any monarch since antiquity. 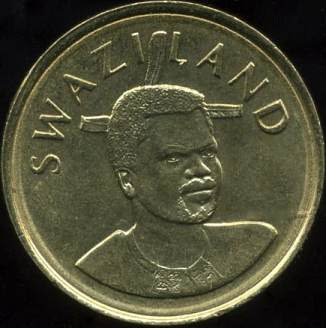 Sobhuza's personal reign of over 60 years (1921–82) saw Swaziland's independence from Great Britain in 1968, after which he was styled King of Swaziland. When the kingdom became independent, it was considered possible that the existing tribal government could be modified into a constitutional monarchy. This existed for some time, until April 12, 1973, when he repealed the constitution and dissolved parliament, making himself absolute ruler. 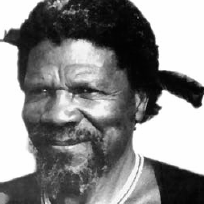 In the early 1980s Sobhuza attempted to gain control over KaNgwane, a Bantustan set up by the South African apartheid government. Sobhuza died in 1982, having appointed Prince Sozisa Dlamini to serve as 'Authorized Person', advising a regent after his death. The first regent was Queen Dzeliwe, but after a power struggle Sozisa deposed her and replaced her by Queen Ntombi, while at the same time Ntombi and Sobhuza's young son Mswati was designated as Crown Prince. 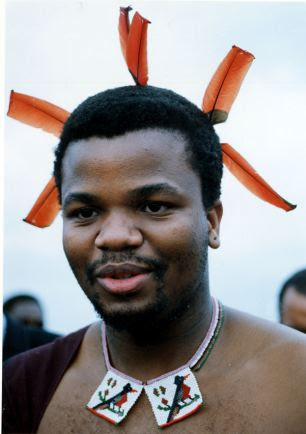 Mswati was crowned as king in 1986. Mswati III (born Makhosetive Dlamini in 1968) is the King of Swaziland and head of the Swazi Royal Family. In 1986, he succeeded his father Sobhuza II as ruler of the southern African kingdom. He is generally considered to be one of the last absolute monarchs in the world, as he has the authority to appoint the country's Prime Minister, members of the cabinet, and the judiciary. Ntombi (born c. 1950) has been the Indlovukazi (Great She-Elephant) and Joint Head of State of Swaziland since 1986. She was also regent of Swaziland from 1983 to 1986. She was born Ntombi laTwala. She is the mother of King Mswati III. 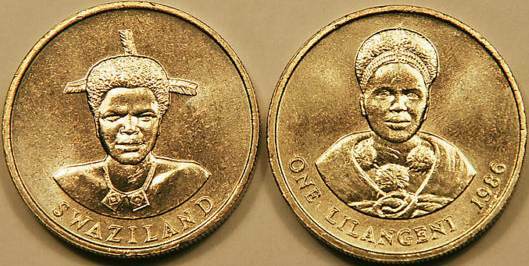 The young Mswati (obverse) and Ntombi (reverse). 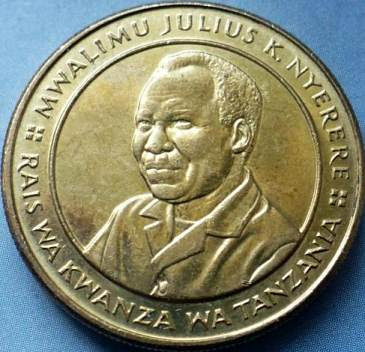 Julius Kambarage Nyerere (1922 – 1999) served as the first President of Tanzania and prior to that of Tanganyika, from the country's founding in 1961 until his retirement in 1985. In 1961 Tanganyika was granted self governance and Nyerere became its first Prime Minister on 9 December 1961. A year later he was elected President of Tanganyika when it became a republic. He was instrumental in the union between the islands of Zanzibar and the mainland Tanganyika to form Tanzania, after the Zanzibar revolution on 12 January 1964 which toppled the Sultan of Zanzibar Jamshid bin Abdullah. The coup leader, a stonemason from Lira, Uganda, named John Okello, had intended Zanzibar to join Kenya. 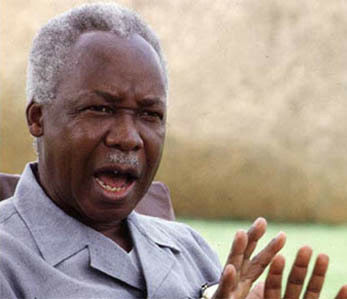 Nyerere, unnerved by the Tanganyika Army mutiny a few days later, ensured that Okello was barred from returning to Zanzibar after a visit to the mainland. From the mid 1970s on he was one of the leaders of the Front Line States which campaigned in support of black majority rule in southern Africa. In 1978 he led Tanzania in war with Uganda, defeating and exiling the government of Idi Amin. Nyerere was instrumental in the 1977 coup in Seychelles which brought France-Albert René to power. 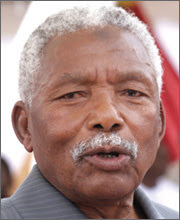 Ali Hassan Mwinyi (born 1925) is a Tanzanian politician. 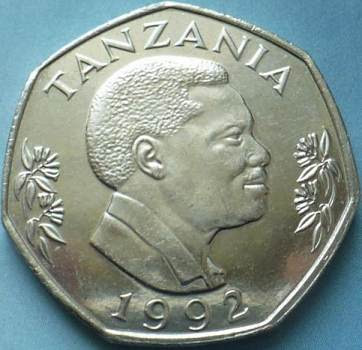 He was the second President of the United Republic of Tanzania from 1985 to 1995. 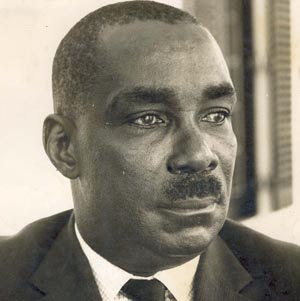 Sheikh Abeid Amani Karume (1905 – 1972), was the first President of Zanzibar. He obtained this title as a result of a popular revolution which led to the deposing of the last Sultan in Zanzibar in January 1964. 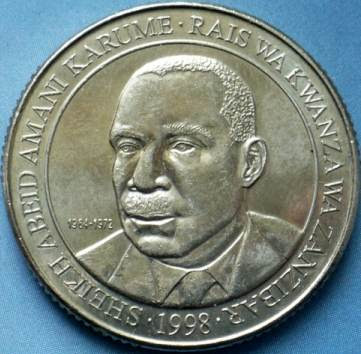 Three months later, the United Republic of Tanzania was founded as Tanzania, prompting Karume to become the first Vice President of the United Republic along with Julius Nyerere of Tanganyika as president. He was the father of Zanzibar's former president – Amani Abeid Karume. Karume was assassinated in April 1972 in Zanzibar Town. Amani Abeid Karume, Sheikh Abeid's son, was twice elected president of Zanzibar, in 2000 and 2005 by a popular majority and handed over power in late 2010 to his successor Ali Mohamed Shein. General Gnassingbé Eyadéma (born Étienne Eyadéma, 1937) was the President of Togo from 1967 until his death in 2005. He participated in two successful military coups, in January 1963 and January 1967, and became President on April 14, 1967. As President, he created a political party, the Rally of the Togolese People (RPT), and headed a single-party regime until the early 1990s, when reforms leading to multiparty elections began. 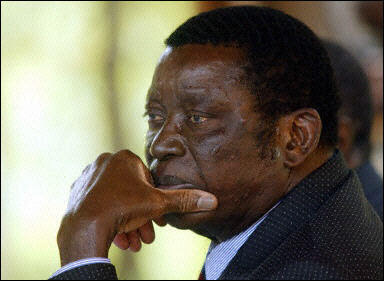 Although his power was seriously challenged by the events of the early 1990s, he ultimately consolidated power again and won multiparty presidential elections in 1993, 1998, and 2003; the opposition boycotted the 1993 election and denounced the 1998 and 2003 election results as fraudulent. At the time of his death, Eyadéma was the longest-serving ruler in Africa. On 5th February 2005 Eyadéma died in a plane, 250 km south of Tunis, Tunisia. He died "as he was being evacuated for emergency treatment abroad", according to a government statement. Officials have stated that the cause of death was a heart attack. At the time of his death he was the longest-serving head of state in Africa. 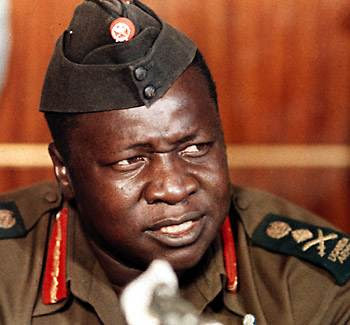 Idi Amin Dada (c. 1925 – 2003) was a military leader and the third President of Uganda from 1971 to 1979. Amin joined the British colonial regiment, the King's African Rifles in 1946. Eventually he held the rank of Major General in the post-colonial Ugandan Army and became its Commander before seizing power in the military coup of January 1971, deposing Milton Obote. He later promoted himself to Field Marshal while he was the head of state. Amin's rule was characterized by gross human rights abuse, political repression, ethnic persecution, extrajudicial killings, nepotism, corruption, and gross economic mismanagement. During his years in power, Amin shifted in allegiance from being a pro-Western ruler enjoying considerable Israeli support to being later backed by Libya's Muammar al-Gaddafi as well as the Soviet Union and East Germany. In 1975–1976, Amin became the Chairman of the Organisation of African Unity, a pan-Africanist group designed to promote solidarity of the African states. During the 1977–1979 period, Uganda was appointed to the United Nations Commission on Human Rights. In 1977, after the last two British diplomats withdrew from Uganda, Amin declared he had beaten the British and added "CBE", for "Conqueror of the British Empire", to his title. Dissent within Uganda and Amin's attempt to annex the Kagera province of Tanzania in 1978 led to the Uganda–Tanzania War and the demise of his regime. Amin later fled to exile in Libya and Saudi Arabia until his death on 16 August 2003. This piece is listed as one pound, 1975. Amin ordered a few pieces only to be struck, presumably to satisfy his vanity. Apolo Milton Obote (1925 – 2005) was a Ugandan political leader who led Uganda towards independence from the British colonial administration in 1962. Following the nation's independence, he served as Prime Minister of Uganda from 1962 to 1966 and President of Uganda from 1966 to 1971, then again from 1980 to 1985. He was overthrown by Idi Amin in 1971, but regained power after Amin's 1979 overthrow. His second rule was marred by repression and the deaths of many civilians as a result of a civil war known as the Ugandan Bush War. On 27 July 1985, Obote was deposed again. As in 1971, he was overthrown by his own army commanders in a military coup d'état. Obote fled to Tanzania and later to Zambia. 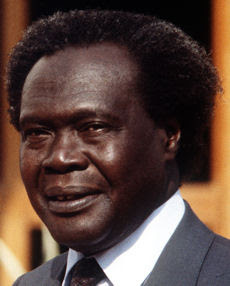 On October 10th 2005, Obote died of kidney failure in a hospital in Johannesburg, South Africa. 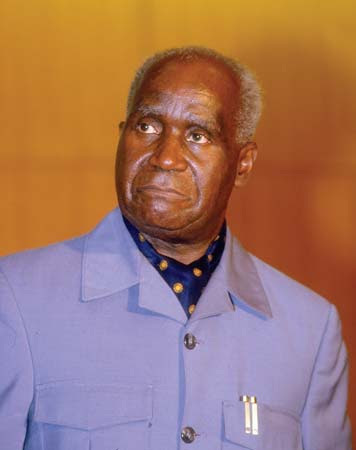 Kenneth David Kaunda (born 1924) served as the first President of Zambia, from 1964 to 1991. His close friend Julius Nyerere stepped down from the republican presidency in Tanzania in 1985 and encouraged Kaunda to follow suit. Pressure for a return to multiparty politics increased and Kaunda voluntarily yielded and called for multiparty elections in 1991, in which the Movement for Multiparty Democracy (MMD) won. Kaunda left office with the inauguration of MMD leader Frederick Chiluba as president on November 2, 1991. He was the second mainland African head of state to allow free multiparty elections and to have relinquished power when he lost: the first, Mathieu Kérékou of Benin, had done so in March of that year. Chiluba later attempted to deport Kaunda on the grounds that he was a Malawian. The MMD dominated government barred citizens with foreign parentage from standing for the presidency, to prevent Kaunda from contesting the elections in 1996, and Kaunda retired from politics after he was accused of involvement in a failed 1997 coup attempt. In 1999 Kaunda was declared stateless by the Ndola High Court, but he successfully challenged this decision in the Supreme Court of Zambia, which declared him to be a Zambian citizen in the year 2000. Since retiring he has been involved in various charitable organizations. The current President of Zambia Michael Sata, a protege of Kenneth Kaunda, has been making use of the former leader as a roving ambassador for Zambia.